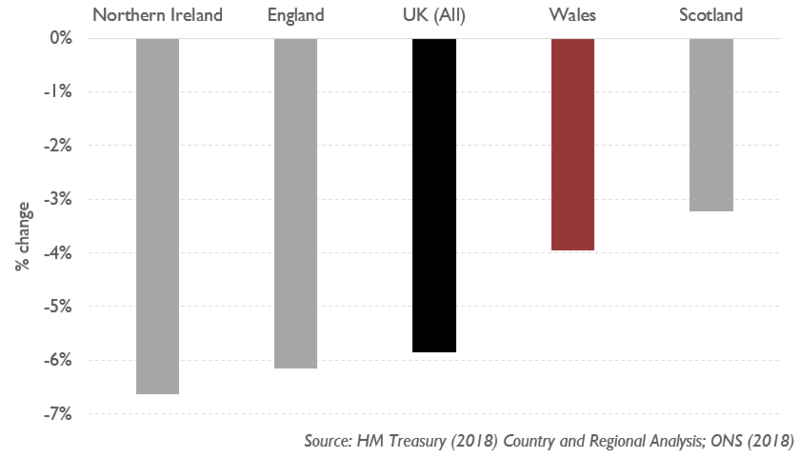 HM Treasury’s Country and Regional Analysis data reports on spending that can be allocated to the countries and regions of the UK, or ‘identifiable’ spending (which represents 88% of total public spending in the UK). It allows us to examine the composition and trends in public spending for Wales, across both devolved and reserved functions, and draw comparisons with other countries and regions of the UK. According to the latest release, total identifiable expenditure for Wales reached £32.5 billion in 2017-18. Spending grew by 1.4% in real terms from 2016-17, the largest year-on-year increase in spending since 2009-10. On a per person basis, spending was around £10,400 in 2017-18. Figure 1 shows the real terms trend in per person spending from 1999-00. In a sharp contrast to the first ten years of this time period (which saw average growth of 4.4% a year), since 2009-10, average year-on-year growth has been negative and total spending per head in Wales was 4% lower in 2017-18 compared to 2009-10. Public spending has fallen slightly faster in England and Northern Ireland compared with Wales and Scotland since 2009-10 (figure 2). This mainly reflects a peculiarity of the Barnett formula which determines annual changes in devolved block grants. Simply put, it does not wholly account for Wales and Scotland’s slower growing populations. The first decade of devolution saw a rapid convergence of spending per head in England and Wales. In 1999-00, for every £100 spent per head in England, £118 was spent in Wales. However, since 2009-10, spending per person in Wales has again started to diverge from the English level meaning that in 2017-18, for every £100 spent in England, nearly £115 is spent in Wales, up from just under £112 in 2009-10. As pointed out by Eurfyl ap Gwilym in an article earlier this year, there is a significant difference between this figure for relative spending per head, and the much higher estimate of the relative funding Wales receives through the block grant (which funds most of devolved spending) compared with England. In a report in December 2016, we estimated that Wales received £120 per head through the block grant for every £100 per head spent in England on services devolved to Wales. A methodology for assessing this relative funding level was agreed as part of the Welsh Fiscal Framework negotiations. Included in the identifiable spending figure but not included in the ‘Barnett’ figure is: Welsh Government annually managed expenditure (AME), spending funded by Non-Domestic Rates and Council Tax (lower in Wales), EU funding (much higher in Wales), social protection spending by the UK government (higher in Wales) and other reserved spending by the UK government. 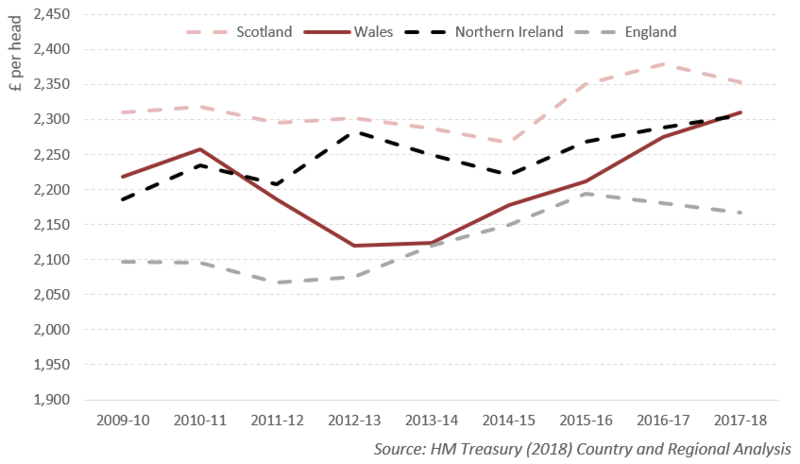 A crude attempt to reconcile the two figures using various data sources suggests that Wales gets much less than a per person share of non-devolved, non-social protection spending from the UK Government. This is an issue we will be exploring further in future analyses. The biggest component of identifiable public spending in Wales is Social Protection, which includes reserved spending on social security (including pensions) as well as devolved spending on social services. 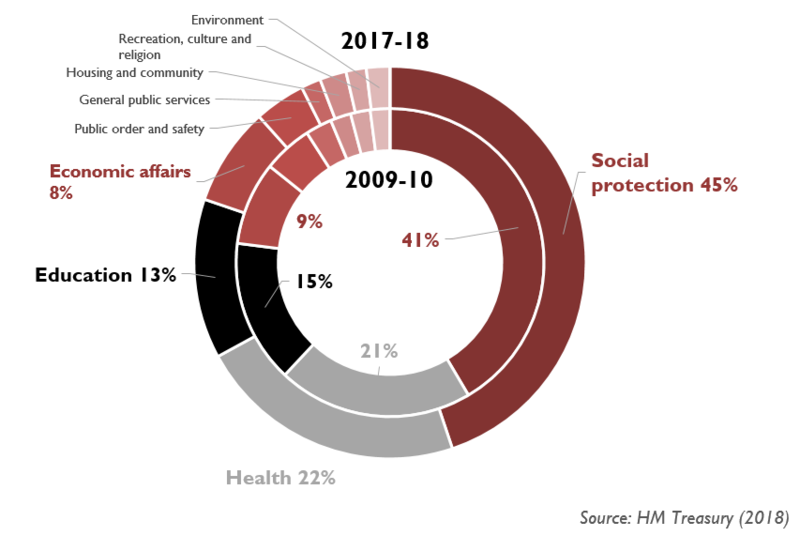 Despite the reduction in total spending in Wales, social protection spending has increased since 2009-10 by around 5%, mainly reflecting growth in pensions spending. This means that social protection now accounts for a significantly larger share of total identifiable spending in 2017-18 (45%) compared with 2009-10 (41%) (figure 3). Health spending also accounts for a larger share of total expenditure (22%) compared to 2009-10. In 2017-18, total health spending per head in Wales was £2,310. This figure is lower than the equivalent figure for Scotland (£2,353), similar to Northern Ireland (2,306), but 7% higher than the level in England (£2,168). Notably, Wales has seen a faster rise in health spending per head between 2013-14 and 2017-18 than any other UK country. During this period, health expenditure per person increased by £186 (8.71%) in real terms (figure 4) in Wales. From 2010-11 to 2013-14, health spending per person in Wales had converged with the level in England, as the UK Government decided to protect health spending in England while the Welsh Government spread cuts over more areas. The Welsh Government also offered greater protection for social services in Wales compared with their counterparts in England. The combined spending per head on health and social services was £2,916 in 2017-18, around 11% higher than the level in England. The growth in social protection and health spending over this time period means that other areas have faced steep cuts. Total spending outside of social protection and health has fallen by 14.5% since 2009-10. The trends analysed above reflect decisions taken at a UK, Welsh and local level. Spending by the Welsh Government and local government in Wales accounted for around 59% of identifiable spending in 2017-18, with UK government departments accounting for the rest. Extra funding announced for the NHS in England this year means that the Welsh Government budget for day-to-day spending will start growing again from next year. 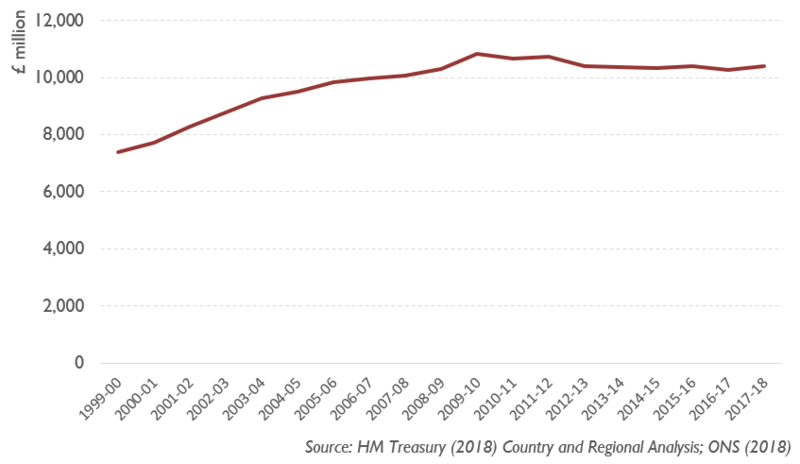 However, last month we estimated that even after this funding boost, Welsh Government day-to-day spending per person in 2023-24 will still be below its 2010-11 levels in real terms. Tough choices and trade-offs remain for the Welsh Government. On the UK government spending side, there are also significant cuts to working-age benefits for Welsh households still working their way through the system. Spending may have grown last year and austerity may be ‘finally coming to an end’, but the effects of spending decisions taken since 2010 are here to stay. Some areas of public spending which are not allocated geographically, such as spending on defence and on public sector debt interest payments, are not included in this analysis.